In Search of North America's Tallest Dome? My search started in Chicago. The record keepers no longer list Sears Tower as the world's tallest building, giving the nod to some structure in SE Asia. Now that Asian building is mostly antenna, whereas people live and work in Sears Tower. Oh well, Sears has the world's highest-from-the-ground-floor gift shop. A winter storm diverted our plane to Detroit where a long wait at the airport was made tolerable by the purchase of this snowdome. There's not much more I can say about the Motor City. The St. Louis Arch is only about 600 feet high, but if you've ever gone to the top, you will be glad it was a short trip. The tram ride is claustrophobic, and the inside can be hot and humid during the summer. Nonetheless, there is a way up there and any snowdomer has to go. Unfortunately, I found no snowdomes for sale inside the arch complex, although there is a wonderful museum about the opening of the West. Buy this snowdome at one of the nearby hotels. Arrive early if you want to see the Statue of Liberty during the summer tourist season. The wait at the ferry boats can be long. Save time for the trip over to Ellis Island too. 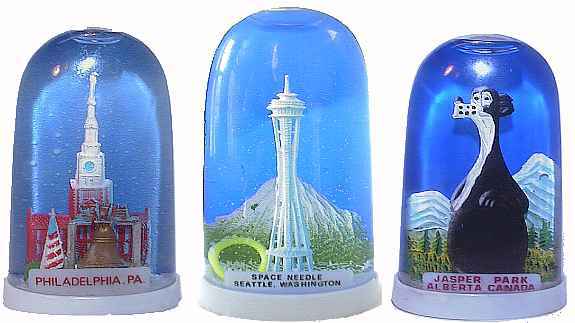 There are all kinds of NYC snowdomes with the Statue of Liberty. I like this one the best. You're probably wondering about the Empire State Building snowdome? I don't have one. Several years ago, the airlines offered a $39 roundtrip ticket between Chicago and San Francisco, but the fare was only good for the two days after our Thanksgiving holiday. We flew out to California at 5:30 on a Friday morning, and were back home after 24 hours of travel. San Francisco was unusually warm and sunny that trip. It was nice to stroll around Fishermans Wharf in shorts and hear Christmas carols over the outdoor speakers. 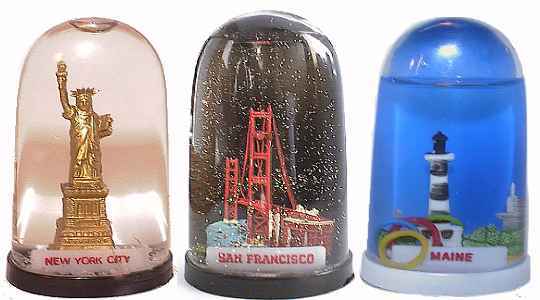 There was time to walk on the Golden Gate Bridge and buy this snowdome at its visitor center. There weren't too many places to buy snowdomes in Maine. Bar Harbor is one popular tourist spot. Lighthouses in Maine are among the taller buildings, but they're still relatively short. No matter. They left room on the inside of this dome for future growth. At the top of Philadelphia's Independence Hall, you can look out see the statue of William Penn on top of the city capital building. For contemporary folks, a more famous statue of Rocky Balboa was put up very close to Mr. Penn at the staircase immortalized by Sylvester Stallone in the movie Rocky. True immortality would require a Rocky snowdome. Jasper is up past the Canadian Rockies, north of Calgary and Edmonton. The bears stand tall up there, and they let you know it with this snowdome. 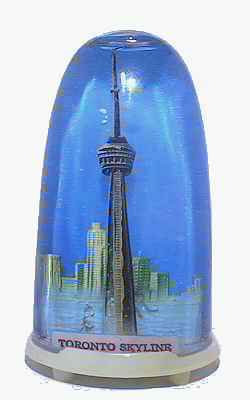 When I bought this dome, the Toronto tower was situated in the middle of a big construction zone. A domed stadium now sits nearby, and the whole area is vibrant with shops and people. The new domes now have to be round and broad, so that they can show off all the new architecture.